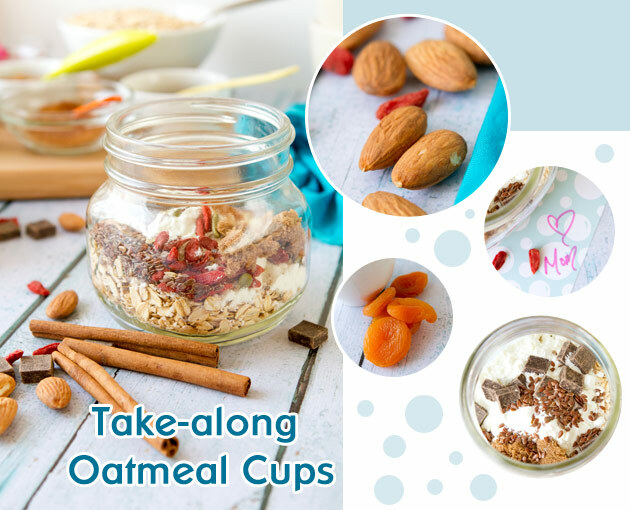 If I were a Mom and had to make breakfast for my little chiclets every day, I’d make them these take-along oatmeal cups. My kids would roll their eyes at the notes, embarrassed by their Mother’s love, but deep down they’d feel loved, appreciated, and go out to conquer the world with a full tummy. 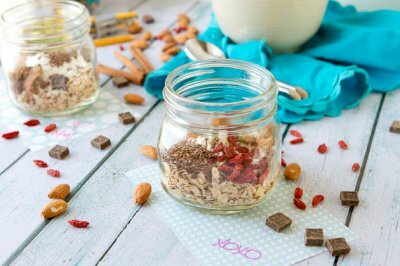 And, if I were trying to encourage them to get excited about making their own breakfast, I’d line up a bunch of bowls with fun toppings like goji berries, pumpkin seeds, apricots, chocolate, flax and cookie crumbles and have them assemble their own cups. And hey, if you don’t have a pack of wild children to feed… you could just make these for yourself, too. 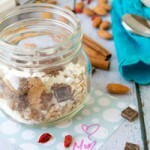 This recipe was developed for Happy Days Goat Dairy. For the goat cheese version of this recipe, click here. 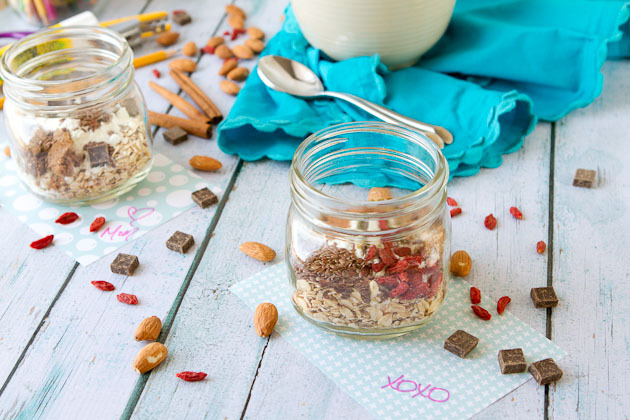 Customize homemade oatmeal packets for a healthy, homemade, on-the-go breakfast. Begin by assembling your cups. The recipe above makes 1 serving. Feel free to make as much, or as little as you want. Place a serving of oats and powdered milk or substitute into each jar. Top with whatever you have handy. 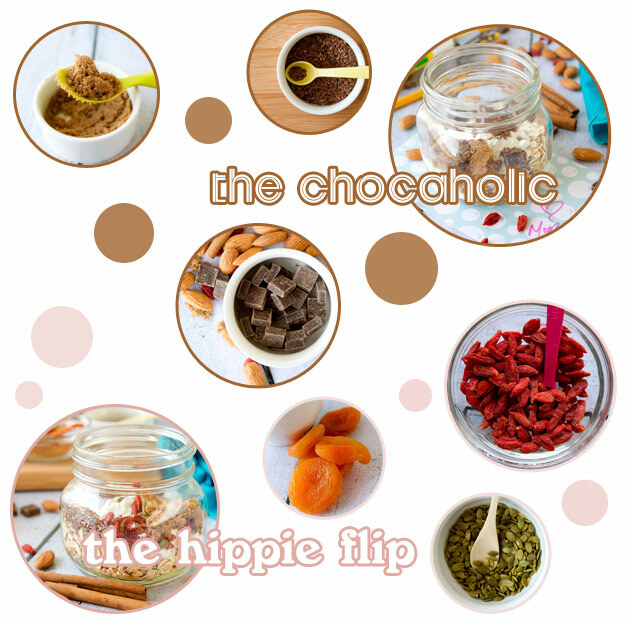 Nuts, seeds, dried fruit, homemade cookies, etc. When you're ready to eat, add 1 cup water and microwave for 4-5 minutes. Be careful, the dish will be hot when you take it out of the microwave! If you don't want a warm oatmeal, add 1 cup non-dairy milk the night before and leave to sit in the fridge. Enjoy cold in the morning. To make a microwave-free version of these oats: replace the rolled oats with quick flakes and pour hot water over the mixture instead of microwaving it. Allow to sit for 2-3 minutes before enjoying. 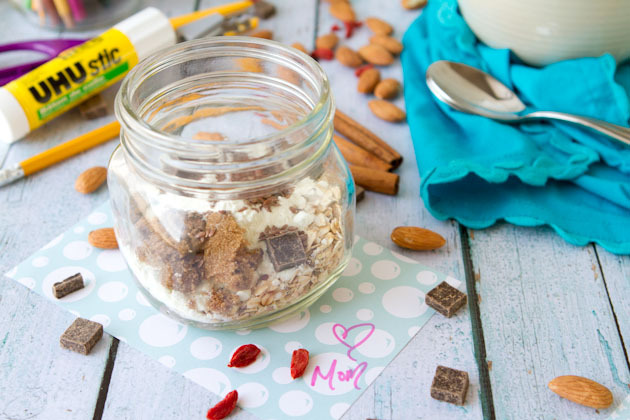 It’s fun to lay out a bunch of the different toppings you plan to use for your oatmeal, especially if you’re planning to do this activity with your children, friends, or heck… your husband. Things like dried fruits, nuts, seeds, and sweets are great! Prepare a 750mL jar, or a couple of them if you plan to make a big batch. Begin assembling your jar by adding oatmeal, then your choice of powdered milk or powdered milk substitutes from the list above. Now it’s time to customize! Add a bunch of different toppings and get creative with the flavors. Screw the lid on tight, and store in the pantry for up to 3 months. When you’re ready to enjoy, just add 1 cup water and microwave for 4-5 minutes. I’d be flat-out lying if I said I was enjoying myself in Montreal. It’s beautiful here, our house is nice, the neighbors are great, but it doesn’t feel like home. This move has been more challenging than I thought it was going to be. I’m lonely, sad, and a downright sloppy mess at times. I understand these things take time, require patience and an open mind but I keep feeling like this change was wrong for us and that we’ve messed up our lives somehow even though deep down inside I know that’s not true. Thankfully, my previous employer asked if I’d be interested in coming back to Calgary for a couple of days to help the team. Perfect, right? Ah universe, you’re so awesome. I’m hoping that a couple of days back home will…help. I’m not sure how, it may make me more sad, but I’m willing to risk it if it means getting a big hug from my Dad. My flight leaves in 45 minutes and I can’t wait. See you on the West coast! Video: Time to Carb-Up? Signs To Watch For + Why I Do It.